Since the contour lines represented heights 50m apart, the height difference between point B and C is 50m. Given the distance between B and a point H (for example), the slope, angle of elevation, and diagonal distance between B and C can be calculated through trigonometric ratios. A triangle must be produced in order to represent the relevant data. 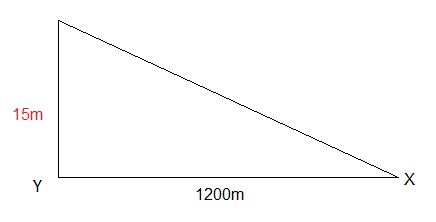 Point X is 15m above a certain level and point Y is 30m above that same level. That indicates that there is a 15m difference. This information is in red, below.